Robert T. Tally Jr., Volume editor (New York: Chelsea House, 2008). Edgar Allan Poe's eerie stories and poems continue to captivate readers to this day. He not only wrote such Gothic classics as "The Raven," "The Tell-Tale Heart," and "The Fall of the House of Usher," he also lived a haunted life worthy of one of his tales. 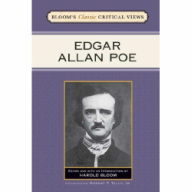 This volume, in the Bloom's Classic Critical Views series, features fascinating critical assessments from the nineteenth and early twentieth centuries, by some of Poe's personal acquaintances, admirers, and critics, and by such eminent writers as Charles Baudelaire, Fyodor Dostoevsky, and William Butler Yeats. Series editor Harold Bloom provides a brief introduction, while volume editor Robert T. Tally Jr. supplies introductory head-notes to each selection as well as longer essays introducing various chapters.